So its the semifinal that everybody wanted, Federer-Nadal. First up in the action today was Rafa Nadal, who easily advanced to the semifinals with a 6-2 6-2 win over Michael Llodra. Roger had the much tougher match-up in his quarterfinal against Robin Soderling but played solid tennis and dispatched the Swede 7-6 (2) 6-4. It was quite impressive how Federer stepped up in saving a 15-40 game at 2-3 in the second set, finishing with a fiery CMON!…and then later on, converting on break point right away at 4-4 in the second set to serve out the match. 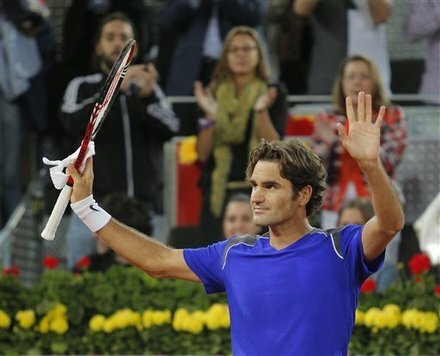 So that sets up the big semifinal match between Roger and Rafa tomorrow. Earlier Thomaz Bellucci upset Tomas Berdych, 7-6 (2) 6-3, and he awaits the winner of the match between Novak Djokovic and David Ferrer in the other semifinal. I hope many of you were able to watch the match and coverage of Madrid right here on FedererFan07 with the newly added feature on the live streaming page.